What’s green and gold and red all over? If there’s one thing I can say about Nikolaus Löwe, it’s that his last name rhymes with “wow!” We were certainly “wowed” by Nikolaus’ steam traction engines back in February and are happy to see he’s keeping the steam dream alive with this handsome locomotive. 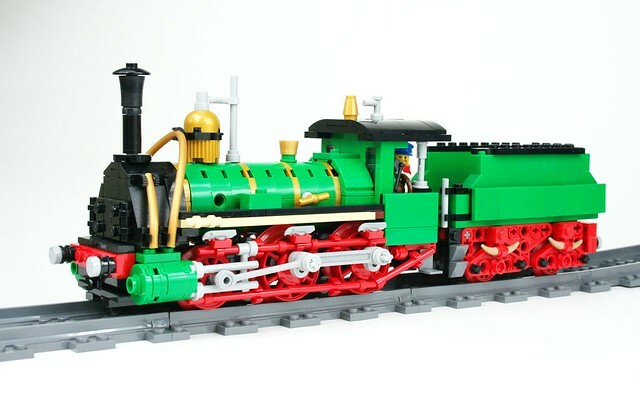 According to Nikolaus, it is modeled after a steam engine that was built in 1875. The way the green body with gold trim rests atop the red undercarriage is eye-pleasing. Speaking of the undercarriage, it sports some serious detailing that would look stunning on its own, including the use of 3D-printed elements for some of the rods. Now that’s the hallmark of an engineer! This classic diesel-electric locomotive dates to the 1940s, and generates a whopping 1,600 horsepower. 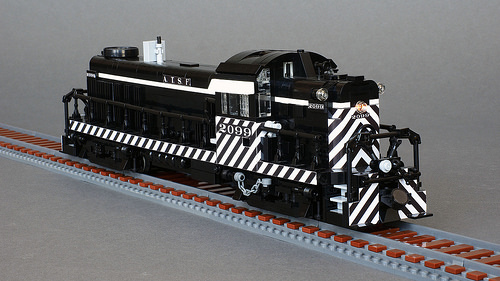 The ALCO RS-2 seen here, #2099, was operated by the Sante Fe railway, and this model by Beat Felber is the spitting image on the real deal, right down the bold stripes, thanks to some careful decal application. It’s powered with Power Functions motors, and also has working headlights. The engine is a switcher, meant for shuffling cars around rather than taking cargo on long hauls across the country, and the builder has paired it with some lovely cars to show it off.